What are the Milestone Birthdays? 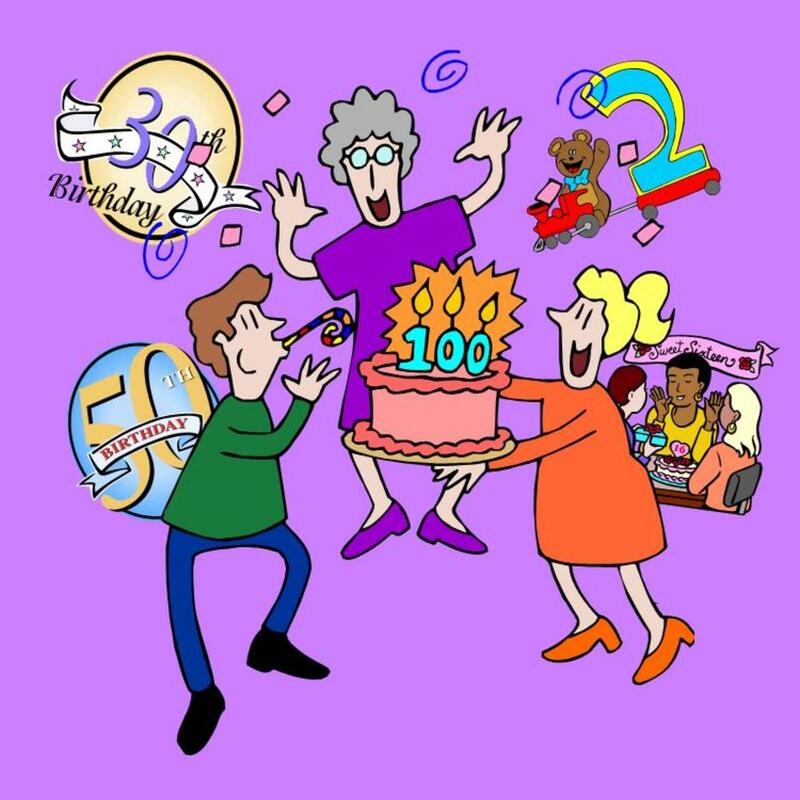 Milestone birthdays are birthdays that land on even numbers such as 50th, 30th, or 100th. Young people have more milestone birthdays including 1, 2, 5, 10, 13, 15, 16, 18, 20, and 21. Some milestones are unrelated to the actual number of years such as 18th birthdays, which marks the legal age of becoming an adult. Each time someone has a milestone birthday, you have the opportunity to say, write, or type a milestone themed birthday message. Below you will find a couple examples of birthday wishes that can be used for each of these different milestone ages. If the two provided aren't enough, you can follow helpful links that will take you more messages for each specific birthday milestone. One-year-old children are not going to read their 1st birthday messages, but you can write something that is fun for others to read. Think of something that will be fun for the parents to read. I know it's only your first birthday, but I'm impressed at how well you're handling getting older. It's amazing that you are already 1. It seems like it was just a year ago that you were being born. Oh, wait... I guess it was just last year that you were being born. I bet it feels great to no longer be 0. You're a whole number this year. I don't know a more cute kid turning one today! Happy Birthday! It all gets tougher from here on. They call it the "terrible two's" for a reason, but a 2nd birthday is a great time to have some fun. Make sure your 2nd birthday wishes are childish and fun. 2 is the perfect age to be the coolest birthday kid! Happy 2nd Birthday! Make sure to give your parents twice the trouble this year. I hope this year is two times as much fun as the first half of your life. You are 2 cute of a two-year-old. This is your second time having a birthday, and I think you're becoming a pro at it. Keep up the good work. Five is a cute age still, and it's a big deal because it's the last year you can count to your age on one hand. Make your 5th birthday wishes amusing. Give me five! Cause that's how old you are now. Happy 5th Birthday! Keep growing and learning, and I'm sure you'll become something special. You already are a special 5 year old. Happy 5th birthday! This is the last year you can show people how old you are every time you wave your hand at them. I can think of 5 reasons you should have an amazing birthday. One reason is that I love you! These are a few 10th birthday wishes examples for someone who is exactly 1 decade old. It's hard to believe that this is the 10th time you've had a birthday. You're growing up fast! You're in the double digits, which means you'll have to start using your toes to count your age starting next year. A decade is a long time, and that's how long you've been around. I hope that you will spend many more decades blessing others with your presence. Why don't you keep your age a nice round number for at least the next year. Happy 10th birthday! These are examples of what to write or say to wish someone a happy 12th birthday. Use these 12th birthday messages to make it a special day. At thirteen, just about any kind of birthday message will work. Try these 13th birthday wishes to get you started. As a teenager, you'll probably get a lot smarter. Remember to keep some of what you know to yourself. No one like a know it all. You're a teenager now, which means it's time to stop trusting adults. Adults stop trusting you on your 13th birthday too. In some cultures you'd be considered an adult at age 13. Unfortunately for those kids, they don't have much time to play video games. 13 is bad luck, but does that mean it's bad luck for you or for all the people around you? You are a teenager now. These are just a few examples of 15th birthday messages. I would tell you to act your age, but I don't want to set my expectations to low. 15 is the age when you can begin to see the potential in a future adult. Whether that potential is good or not is yet to be determined. At age 15, nature starts letting children try out their adult bodies. Be careful you 15-year-old! At 15 most parents magically transform into totally uncool and embarrassing people. Don't worry though, they'll grow out of it in a few years. It's usually the jokes about driving that make a 16th birthday message fun. Drive your 16 year old crazy by adding to the endless jokes. If you can't drive a car yet, drive your parents... CRAZY! 16 is a great number for a great day and a great person. What makes me most uncomfortable about 16 year old drivers isn't the fact that they are 16, it's that they were 13 years old just three years ago. 18 is the first birthday that you get to write a message that contains an adult joke. No, not that kind of adult joke, a joke about becoming an adult. Enjoy these 18th birthday wishes. You're turning 18, so you can do anything you want on your birthday. Well, almost anything you want. It's not just your parents and friends who will start treating you like an adult now that you are 18, even the police and judges want to give you more responsibility for your actions. Remember that 18 is the just the beginning of a long difficult journey through adulthood. What do 18 year old people and 100 year old people have in common? Neither can support themselves. At least you still have your parents around to help. At 20, you are no longer a teenager, you've already been an adult, and you aren't 21 yet. Is there anything special to write in a 20th birthday card? Here are a few ideas for 20th birthday wishes. Welcome to your 20's. You're not a teenager any more. You've been around for 2 decades. I hope the world will be blessed with your presence for many more. 20 is the ultimate overrated milestone birthday, because it is sandwiched between 18 and 21. There's one really great thing about turning 20. You still can't drink alcohol, so you may remember it. 21st birthday wishes are all about legal stuff that used to be illegal. Wishing you loads of fun as you turn 21. I can't think of anything special about your new age. Can you? Just remember, just because it's legal, it doesn't mean it's always a good idea. Now you have at least 21 more dangerous things that you can do while drinking legally. Stay safe and happy on your 21st. 30th birthday messages should be as boring as possible, because at 30, all of your fun is over. It's time to grow up. Jesus started his ministry at age 30. I have high hopes for what you'll accomplish in your 30's. No pressure, but Jesus healed people and saved the entire world. 40 may be the worst age possible. There are no benefits of being "old" yet, but all the drawbacks have already begun. Cheer up a friend or family member with a silly 40th birthday message. A 40 year old is like an older version of a 30 year old. I hope to have the same vitality and youthful look when I get to be 50. You could pass for a 40 year old. Congratulations! Now people will get to describe you as the one who is in his/her 40s. 50 is a huge milestone that marks the halfway point to 100. Some people say 50 is over the hill, so write a fun 50th birthday message for a half century old person. It's a good thing that you're over the hill now, because now things will get easier. After 50 years, you have aged to perfection. Even if people lived to be 100 on average, you'd be older than half of all people. I hope you have a happy birthday now that you're 50. I also want you to know that I think your age is nifty. Use these ideas for your 60th birthday card message. You could pass for being 10 years younger than you are actually turning. I don't think most people would guess that you are 70. Age is a matter of perspective. People who are 90 will tell you that you are still young. Think like a 90 year old. I'm hoping that your 60s will be your decade to do whatever you want. Just think how old you felt at 50. Now you are another 10 years older than that. If you are golden at 70, then you become much more valuable. Here are some 70th birthday wishes. Being 70 suits you well! I'm glad you're out of your 60s, because now you won't act so immature. You are the perfect age to be 70. You're also the perfect age to be my friend. I would make a joke about your age, but you're getting too close to life expectancy at this point. I don't joke about people who are actively dying. 80 is the first really huge milestone since it is just past life expectancy. Use these as examples of 80th birthday messages. If you were a bottle of wine, you'd be worth a lot at 80 years old. But since you are an amazing person who is 80, you're priceless. 80 year old people have a humble confidence that younger people don't have. Be careful not to confuse confidence with wisdom. You're a great blessing in many people's lives, and your history of being a blessing is of epic proportions. You have aced life so far, even though you have made mistakes you have also learned a lot. If your age was a grade, you'd have an A- because you'd have a 90%. You're a centenarian, which means you are a roman guard or maybe a half human half horse mythical creature. Which milestone birthday marks the age of being "old?"